Saint Josaphat, Bishop and Martyr - My Catholic Life! Saint Josaphat died for something few in his era died for—ecumenism. In fact, the word ecumenism did not even exist when Josaphat was martyred. Josaphat was born in Ukraine but grew to manhood working a trade in Vilnius, Lithuania. In his late teens he felt called to be a monk, so he rejected an offer of marriage and joined a monastery in Vilnius in 1604. Josaphat’s austerities, intelligence, and prayerfulness made him a natural leader, and he was duly ordained a deacon and priest and earned a reputation as an effective preacher. But it was a historic decision by Orthodox religious leaders, about ten years before Josaphat became a monk, that would bend the arc of his life and eventually lead to his death. In 1595, the Orthodox Metropolitan of Kiev and five other Orthodox bishops representing millions of Ruthenian (Ukrainian and Belarusian) faithful met in the city of Brest, leading to their eventual formal union with the Bishop of Rome. They converted from Orthodox to Catholic, while keeping their Byzantine liturgical rites and traditions. The Union of Brest was a one-of-a-kind event. Yet it triggered Orthodox violence and bitterness toward the Catholic Church, which has endured into modern times. Josaphat joyfully embraced the entrance of his native Orthodox faith into the Catholic fold. But he also insisted that the eastern traditions of his pan-Slavic people should perdure, and be respected, even though these same people fully accepted the authority of the Roman Pontiff. Unity, yes. Uniformity, no. The Church, historically, had long been composed of various liturgical traditions reflecting its numerous cultures. The Latin Rite, though, eventually predominated as Western nations grew stronger and colonized huge chunks of the world. The Union of Brest’s careful balance of accepting theological and jurisdictional unity with Rome while insisting on liturgical distinctiveness was confusing to many of the faithful Slavic peasants of northeastern Europe. Nonetheless, when Josaphat was named a Bishop in present day Belarusia, he continued to champion the union with Rome with all his considerable powers and was largely successful in curtailing Orthodox clergy from exercising ministry in his diocese. Because he represented something new, an Eastern Rite Catholic, Josaphat was misunderstood by his co-religionists who should have supported him the most, particularly Polish and Lithuanian bishops and princes. The tensions of the time came to a head when an Orthodox bishop established a competing diocesan and parish structure alongside that of Josaphat’s diocese and parishes. The faithful experienced two church structures that were virtually identical in their liturgy but divergent in their leaders and lines of authority. In response to Orthodoxy’s aggressive incursion into his ecclesial territory, Josaphat put his usual vigor into preaching and teaching the importance of union with Rome. But in 1623, while seeking to stop an Orthodox priest from secretly ministering in his jurisdiction, Josaphat was ambushed by Orthodox faithful who conspired with their leaders to rid themselves of this thief of souls. 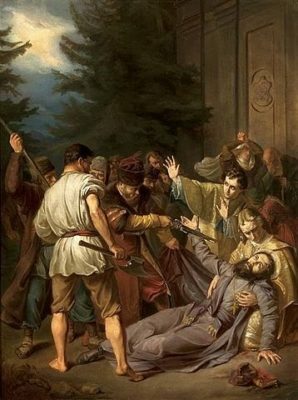 Saint Josaphat was brutally attacked by a mob, his head was cleaved by an axe, and his body dumped into a river. Josaphat was beatified in 1643 and canonized in 1867. In the twentieth century, Josaphat’s remains were brought to Rome and buried under the altar of Saint Basil in Saint Peter’s Basilica. Saint Josaphat, you gave your life attempting to bring East and West together. Give us your spirit of unity so that our prayers bring all Christians into common union under the leadership of a common head, the successor of Saint Peter.